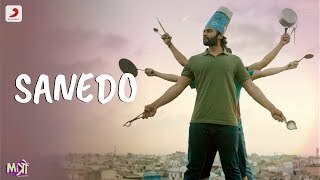 Sanedo Lyrics from Mitron: The song is sung by Darshan Raval and Raja Hasan featuring composers Tanishk-Vayu on additional vocals. This song also has Gujarati touch to it, which is from Nitin Kakkar directed “Mitron” starring Jackky Bhagnani & Kritika Kamra. Sanedo meanig: Sanedo is a popular Gujarati dance song, whereas the word ‘Sanedo’ is derived from ‘Sneh’ which means Affection in English. Arey ra ra ra ra ra… Ra!